Dorner recently worked with a customer who needed to convey small plastic bottles. The solution required a number of different transfers from conveyors and other machinery. While there are many different ways to handle bottle transfers from one conveyor to the next, often times the solution relies on product back-pressure to lessen the chance of the transferring bottle falling forward and onto its side. The solutions devised by Dorner’s Engineered Solutions Group was to use a 2200 Series SmartFlex conveyor with FlexMove Technology as the mainline units and a powered side guide at the transfer points. 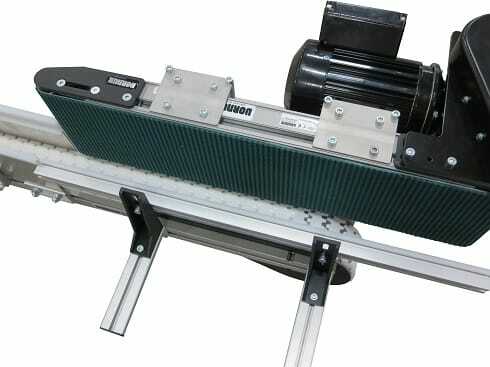 The guide uses a Dorner 2200 Series Belted conveyor with a high friction belt. The high friction belt on the 2200 Series helps to grip the bottle and prevent it from tipping while it transfers from one conveyor to the next. Also, the solution featured numerous power transfers to assist in the small product transfer, an accumulation conveyor at the end of the line for a manual packing operation, and a pneumatically controlled merging setup that allowed two conveyor lines to merge into one line.